Salad leaves are one of the crops that really do benefit from being home grown. No longer do you need to put up with supermarket salad bags that always seem to have a few soggy, smelly leaves in the bottom, you can pick fresh salad get it almost instantly onto the plate as and when you need it. With a few careful variety choices, and a bit of protection from the cold weather, you can be picking greenery all year round. For spring and summer salads you can choose from the wide variety of head lettuce and cut-and-come-again leaves. The former include the small ‘Little Gem’ types, up to butterhead and crispy iceberg varieties. The butterheads and oak leaf lettuces generally provide you a choice between green and red leaves. Good plant choices for home grown lettuce include ‘Red Oak Leaf’ and ‘Buttercrunch’. Sow either in modules for planting out as seedlings, or direct into your raised beds at the spacings specified on the seed packet. If you don’t have raised beds then consider installing one. WoodBlocX raised beds are easy to construct and require no heavy lifting or power tools to build. Made from sustainably-sourced wood, they are certified organic by the Soil Association so are ideal for growing plants which are destined for the table. Cut-and-come-again salads do exactly as described – you cut them and they grow again for a second, sometimes even third and fourth harvest. These seeds should be sprinkled thinly along a shallow drill to give a long line of small leaves, and they should be harvested at this baby leaf stage or they will get overcrowded and run to seed. It’s best to sow them in succession rather than all your rows at once: make an initial sowing in early spring, then once they have germinated, sow a second row and repeat throughout the summer, replacing the earlier rows as they get tired. This ensures you won’t experience a glut. If you’ve got raised beds of around a metre’s width, that’s ideal as a row length. The added height of a WoodBlocX bed can also bring well-drained soil to a boggy garden and rooting space to stony ground or even space to grow where there is no soil at all. 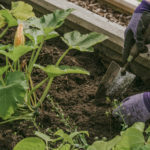 They can be filled (and easily re-filled) with fresh soil that is free from weed seeds and diseases, and rich in nutrients which is important if you are growing consumables. There are plenty of salad mixes available from the seed companies, offering both classic tastes and also those that include spicier, more peppery leaves such as rocket, mizuna and watercress. Lettuces (and vegetables and fruit in general) can be planted more intensively in a raised bed enabling the production of bigger harvests from a smaller space. Whatever you’ve sown, be careful to keep the soil around the plants moist at all times, as not only will this mean your lettuce is crisp and tasty (the plant is made of over 90% water after all), but also helps prevent it run to seed in hot weather. If your lettuce does run to seed it is best discarded, as the leaves will be bitter. Keep an eye out for slugs and snails as well – a night-time patrol or using beer traps is the best ways to keep their numbers down organically. But salad is not just for summer – it can be for Christmas too! Sown in late summer and autumn, there are whole lettuces such as ‘Marvel of Four Seasons’ and ‘Winter Density’ as well as other leaves (miner’s lettuce is a good one) that will survive the winter. It is best to grow these under the protection of a cloche or tunnel to keep the worst of the cold off and again, keep an eye out for the slugs who like to hide in the folds of tunnel plastic during the day. Finally, slugs aside, raised beds can keep plants out of reach of all kinds of household pets, and most importantly as we’re talking lettuce here – rabbits.